Dr. Susan Landes has been working in the fields of mental health and addiction since 1987. She received her master’s degree in Clinical Psychology with a Specialization in Alcohol and Other Drug Addiction from J.F. Kennedy University in 1989. Susan earned her doctorate from the Wright Institute in 2003. The primary focus of Susan’s clinical work has been issues related to addiction and trauma work including, individual therapy, early intervention with adolescents, family therapy, family therapy with adult children, and couples work. While a student at the Wright, Susan became excited about DBT and its application to co-occurring disorders. She completed numerous training’s with the Marsha Linehan training group (Behavioral Tech). Susan currently has a psychotherapy practice in Auburn. In 2008, she opened the Auburn Davis Center for DBT. 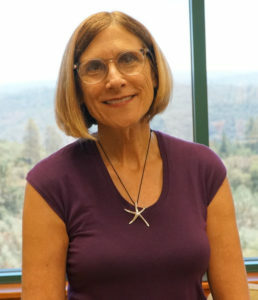 Additionally, Susan provides supervision, consultation and program design and development for several substance abuse treatment programs and has been an adjunct professor at CSU Sacramento and at Alliant International University.